Recent research by the University of Otago, Wellington has shown that giving brain cancer cells high dose vitamin C makes them much more susceptible to radiation therapy. The study, carried out in association with Wellingtons Malaghan Institute was recently published in Free Radical Biology and Medicine. Lead author Dr. Patries Herst together with Dr. Melanie McConnell investigated how combining high dose vitamin C with radiation affected survival of cancer cells isolated from glioblastoma multiforme (GBM) brain tumors, and compared this with the survival of normal cells. Herst says GBM patients have a poor prognosis because the aggressive GBM tumors are very resistant to radiation therapy. We found that high dose vitamin C makes it easier to kill these GBM cells by radiation therapy. She says there has long been debate about the use of high dose vitamin C in the treatment of cancer. High dose vitamin C specifically kills a range of cancer cells in the laboratory and in animal models. It produces aggressive free radicals in the tumor environment but not in the environment of healthy cells. The free radicals damage DNA, which kills the cells, but the high concentration necessary to kill cancer cells can only be achieved by intravenous injection. However, these promising findings have so far not been validated in clinical studies. 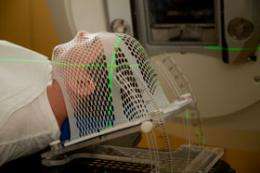 If carefully designed clinical trials show that combining high dose vitamin C with radiation therapy improves patient survival, there may be merit in combining both treatments for radiation-resistant cancers, such as glioblastoma multiforme, says Dr. Herst.